We want to introduce you to the vibrant flavors eaten in Indian households across the globe. Here in Kasa Indian Eatery, we take pride in freshly grinding spices, marinating meats in our special Tandoori marinades for 24 hours and crafting small-batch vegetarian specials daily. We stick to a limited menu so that we can cook you fresh food all day long. Right down to every chutney, hot sauce or morsel of cardamom-scented rice, our food bursts with flavor and color. We think great food can be affordable and quick. We pride ourselves on serving delicious meals that rival fine dining but doing so in a fun, casual environment and at reasonable prices. Kasa belongs to the community just as much as it does to us. Connecting with you is our favorite part of running Kasa. We strive to be warm, friendly, accommodating to our customers while being a force for good in supporting community organizations. Kasa was born in 2008 out of a burning desire to get San Francisco hopelessly hooked on vibrant Indian flavours, colors and culture. 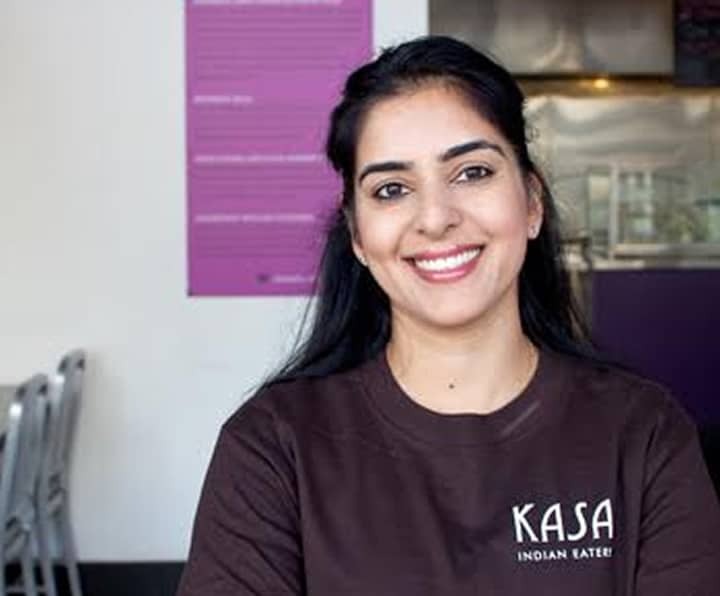 The passionate team behind Kasa is led by British-born lawyer-turned-mother-turned-chef Anamika Khanna, a graduate of the London School of Economics who moved to SF in 2000. Today, Kasa has three locations across San Francisco and Redwood City and a catering business.